Hello and welcome to the 99th installment of the SWD. Syrian Arab Army didn’t advance against Islamic State in eastern Aleppo today, but rather reinforced recently captured territory reducing the likelihood of a successful IS’ counterattack. Amaq Agency reported IS damaged SAA‘s tank with an anti-tank guided missile in Tall Feddeh which was captured by SAA yesterday. Syrian Democratic Forces captured on the western axis Salhabiyat al-Gharbiya from Islamic State. During the battles for Salhabiyat, more than 30 IS’ fighters were reportedly killed. On the eastern axis, clashes are still ongoing in Hamrat Nasir with reports that most of the locality is under the control of SDF. Islamic State’s fighters are besieged in the village of Hamrat Balasim. After the advances on the western axis SDF is now only around 2 kilometers (~1.25 miles) away from Baath Dam. Islamic State’s SVBIED targeted SDF fighters in Salhabiyat al-Sharqiya reportedly killing several of them, village was secured by SDF yesterday. Islamic State’s Amaq Agency released a statement claiming responsibility for yesterday’s attack on Ahrar al-Sham’s HQ in Tell Touqan. An improvised explosive device exploded near Sarmin, southeast of Idlib. The casualties of the explosion are disputed, part of the sources claimed several civilians were wounded while the other part claimed a couple of Hayat Tahrir al-Sham’s fighters were wounded. Free Syrian Army factions located in southeastern Syrian desertous area captured Al-Halbah area 50 kilometers (31 miles) southeast of Palmyra from Islamic State. Amaq Agency reported Russian airstrikes killed eight civilians, all women and children during raids on the city of Deir al-Zour. 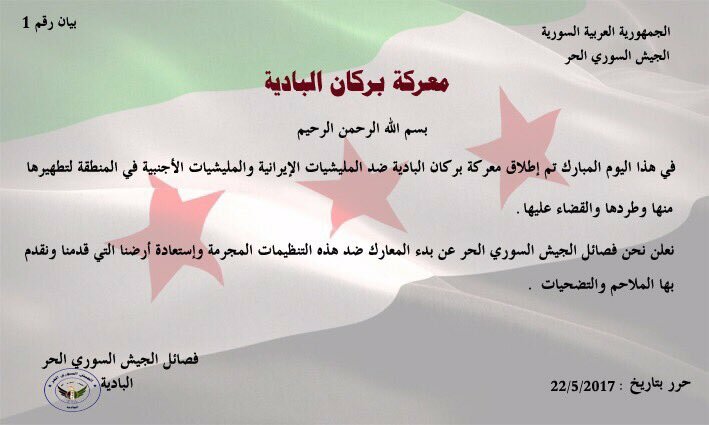 Free Syrian Army groups issued a joint statement about launching a “Desert Volcano” (Burkan al-Badiya) operation against SAA and foreign groups. Aim of the operation is to clear the desertous area of Damascus and perhaps both eastern Homs and Al-Suwayda from SAA‘s presence. Syrian Arab Army launched an attack on Al-Manashiyah district, Daraa in an attempt to regain lost territory from rebels. Even though the rebel areas were heavily shelled and targeted by a significant number of Russian and Syrian airstrikes, rebels managed to repel all of today’s attacks. Rebels also destroyed SAA‘s BMP with an anti-tank guided missile and an ammunition depot in Al-Sijnah district as well as reportedly killed 11 soldiers that tried to advance today. Pro-rebel sources reported rebels were able to damage a Sukhoi Su-24 aircraft over Daraa with anti-air weapons. It is unknown if the aircraft was Russian or Syria, hopefully more will be known in the future regarding this event. Syrian Arab Army and allies secured Zuluf area and entered into Damascus governorate from Al-Suwayda by capturing the Zuluf village. 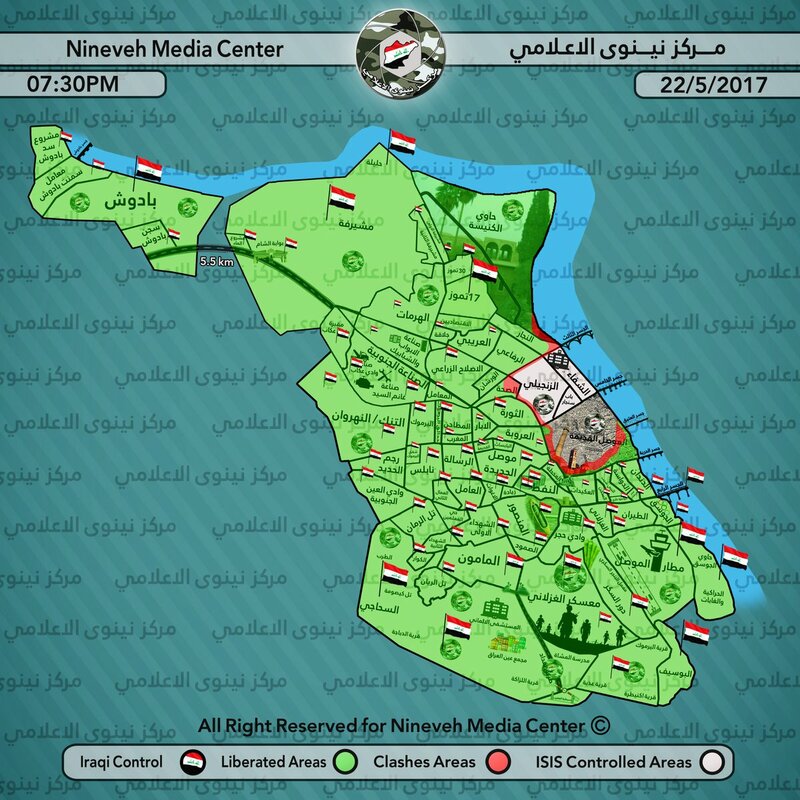 Iraq Joint Operations officially announced Al-Najar district in west Mosul as fully liberated by Iraqi forces from Islamic State. As Islamic State continues to lose territory in west Mosul, Iraqi forces are shifting their focus on the Old Mosul district again. According to Amaq Agency, three Iraqi soldiers were killed and a machine gun position destroyed during IS’ attack on Bab Jadid neighborhood in the Old Mosul district. Similarly, Amaq claimed IS’ sniper killed one soldier in Bab al-Toub neighborhood, Old Mosul district as well as one soldier in Al-Thawra district. Unknown gunmen kidnapped Khazal Thiab al-Dulaimi, director of the municipality of Al-Nimrud district, east Mosul. Two staff members that accompanied the director were also kidnapped and taken to an unknown location. Amaq Agency claimed five Iraqi soldiers were killed and a vehicle destroyed by an improvised explosive device in Al-Tarmiyah yesterday. 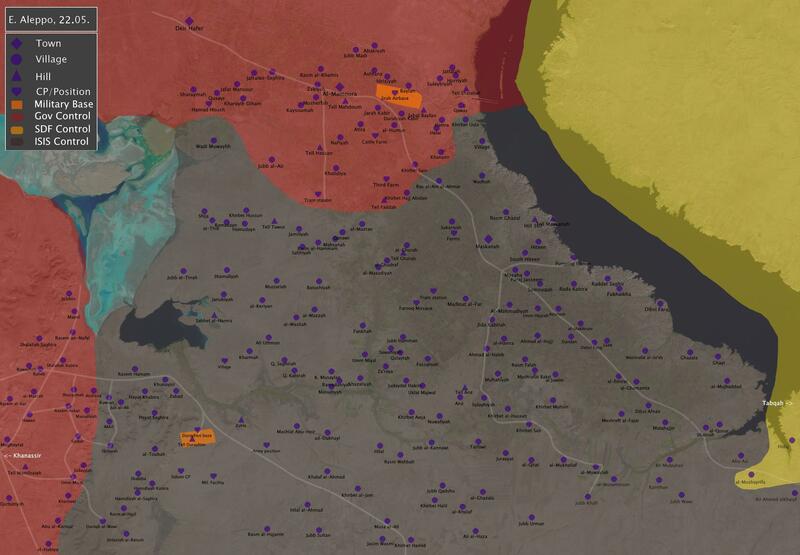 Counterinsurgency operations in Al-Tarmiyah officially ended on the 15th of April, but it appears that Islamic State still has presence in the area. Four Islamic State’s inghimasi (suicide fighters) attacked Karkoush Military Base near Balad Ruz (Baldrouz) very early in the morning. According to Amaq, the base is used by the US’ forces to train Iraqi soldiers in Balad Ruz. Inghimasi reportedly burned 13 military vehicles and caused over a dozen casualties to the forces inside the military base, Amaq says it wasn’t able to obtain information about possible American casualties. Clashes lasted for seven hours and ended when inghimasi detonated themselves against opposing forces. Iraqi sources reported two suicide bombers detonated themselves in the base while the other two were killed. On the 22nd of May 2017 CJTF-OIR has conducted 18 strikes in Syria. CJTF-OIR‘s main focus in Syria at the moment is Tabqa-Raqqa-Deir al-Zour region where they did eight strikes supporting SDF‘s operation against IS destroying three IS barges, two IS wellheads, an IS oil storage tank, an IS oil processing equipment item, 13 fighting positions, 10 vehicles, two supply caches, a mortar system, an IS headquarters; and suppressing an ISIS tactical unit.